Damar Riyadi sent us an email about an application he's been working on: Gofris, a graphical interface for the command line application called Ofris. We already covered Ofris, a Deep Freeze like application for Linux so check out that post for more info. 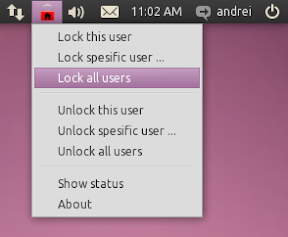 Gofris is not a standard "GUI", but comes with an Ubuntu AppIndicator only - which you can use to lock / unlock the current user, all users or a specific user as well as see the current status. Important: Gofris is in beta so use it at your own risk! Once installed, you can launch Gofris via the Applications > System Tools > Gofris menu item. Thanks to Damar Riyadi for the tip!